Steve Guerdat has the horsepower, the attitude, and the support team to get him to Rio to defend his Olympic title. Steve started down that path early on. As a member of the Swiss team, he rode in five Junior and Young Rider European Championships before reaching the age of 20. 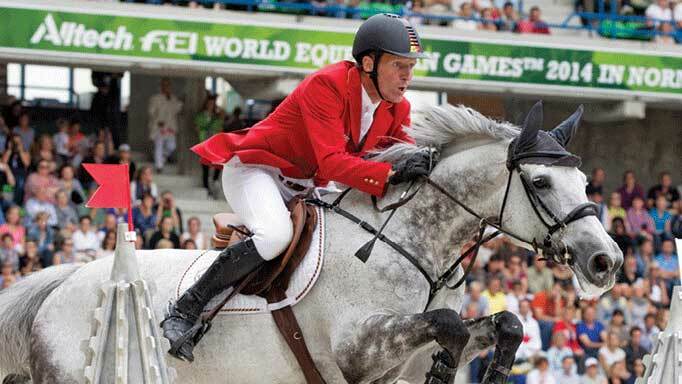 His step up to senior international level was provided by former Dutch Olympian and Global Champions Tour founder Jan Tops, who hired him as stable jockey. Three years at one of Europe’s busiest dealing yards was indeed a powerful learning experience which resulted in Steve’s soar in both stature and up the world rankings. Once released from Stal Tops, Steve found a valuable sponsor in watchmaker Yves Piaget, an old friend of the Guerdat family. Piaget provided him with the BWP stallion Tresor and subsequently his first podium finish at a World Cup Final. After Tresor came Jalisca Solier; the French-bred mare brought Steve his first Olympic medal – team bronze in Hong Kong – and team gold at the European Championships in 2009. For five years, the pair kept Steve near the top of the world rankings. In 2010, Nino des Buissonnets entered his life. A year into their partnership and the rewards came rolling in. Two years in, the greatest prize of them all – individual Olympic gold – was achieved in London. Steve became the first Swiss rider to take the title since Alphonse Gemuseus in 1924. 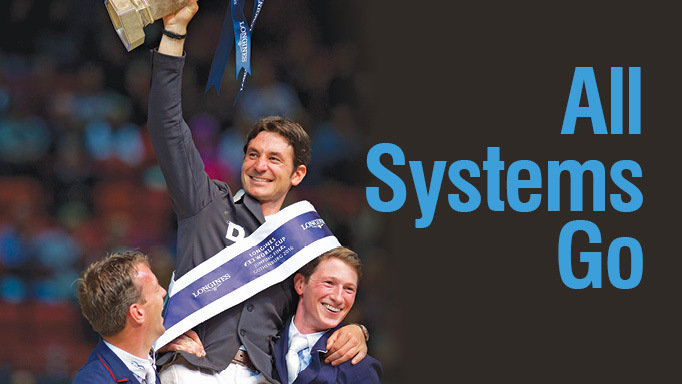 Three months ago in the Scandinavium Arena in Gothenburg, Sweden, Steve galloped to victory in the Longines FEI World Cup Jumping Final for the second year in a row after two faultless rounds with the 10-year-old gelding Corbinian. He feels either Nino or Corbinian could win a medal this summer in Rio. Guerdat is also looking ahead to Aachen in July, where as the winner of the Rolex Grand Prix in Geneva he has the chance to further his stake in the Rolex Grand Slam. Life must be hectic at Herrliberg (his training base near Zurich). What is a typical day like? I get up at 6:30 every morning and I am normally in the stable by 7 a.m. I have 17 horses, from five-year-olds to grand prix. I’ll ride non-stop until one o’clock when we all break for lunch. After lunch, I will carry on riding. I’ll ride seven or eight horses in a day at home. If we are going to a show, we’ll leave Wednesday evening and get back Sunday night. I don’t do any teaching, but occasionally I do help a few people out. I do all my own planning, usually in the evening before watching TV or a movie. My dad, Philippe, was a professional rider. He competed at the Los Angeles Olympics. I grew up surrounded by horses. We had horses like other families had dogs. My earliest memory? I remember falling off a pony when we were on the lunge line – I think I was about three. We lived at the stables; there was always someone around to teach me. Can you identify a turning point in your career when you realized you could get to the top? No. I never thought of doing anything else. Do you feel that there were sacrifices made along the way? I feel very privileged that I can do what I like doing most and make a living doing it. Of course, there are plenty of times when I can’t do something else because of my job, but I’m okay with that. I don’t consider it a sacrifice. Horsepower aside, is there another ingredient that gives you an edge? Having a great team around me. This is a 24/7 lifestyle; you live it every day, morning to evening, so it is very important to have great people around to help. I have a really strong team supporting me, people who get up early every morning and work really hard towards a common goal. What do you think your chances are of defending your Olympic crown in Rio? I like to look at it this way: I am not going to Rio to defend a title; I hope to go to Rio to win another medal. We have a strong team for which I hope to qualify. I’ll bring Nino into form over the next months and if anything goes wrong I have a good substitute in Corbinian – he goes equally well inside or out. What’s more important to you – money or medals? Medals [without hesitation]. I would prefer to be buried with a lot of medals around my neck, rather than with a big bank account. How would your friends and family describe your character? You’d have to ask them, but I think they would say I was a very happy person because I see myself as privileged – enjoying what I do and thankful for everything I have. I am an avid skier, so one day I would like to go heli-skiing in Canada. I go to the gym five or six times a week for cardio and strength training. I really like it. I’ll run at home once or twice a week and I always run when I’m at a show. It’s a good way to see different cities, too. I always take my phone with me, because invariably I will get lost. Candy! I love sweets! I am normally very good about what I eat and I actually really like healthy food. If you were having a dinner party and you could invite four guests, living or dead, who would you invite? My party would be bigger, probably a dozen people, because I would invite my family, my parents, Philippe and Christiane, and my brother, Yannick, and my cousins – and then I would also have my best friends. Do you have a life lesson to share? Learn from your mistakes and aim to do it better the next time, and the time after that, and the time after that. Believe in yourself and your dreams. Be happy with yourself and achieve things for yourself, not for others, or for what they expect of you. Respect others, but be happy with yourself in whatever path you choose to take. 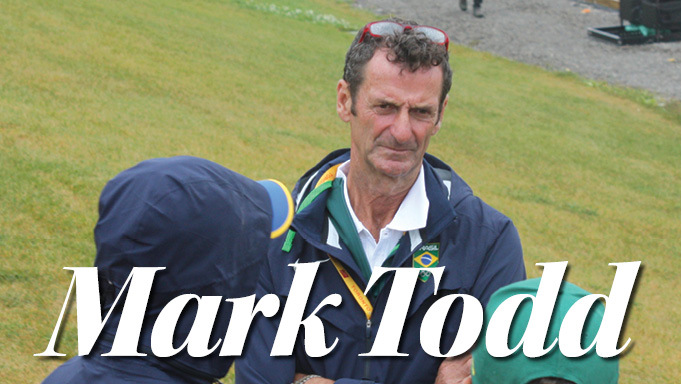 Hunger and desire still run deep as this enduring talent heads for his eighth Olympics. 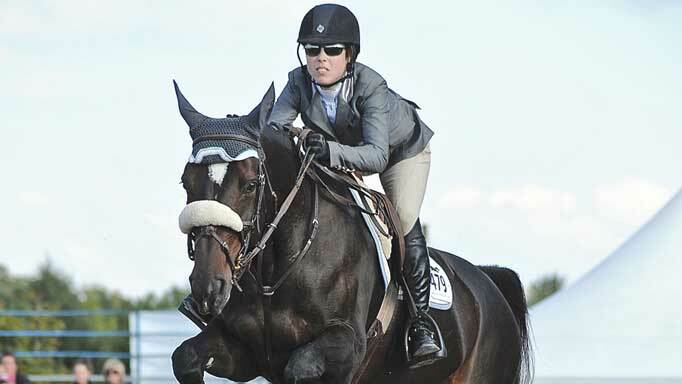 Elizabeth Bates' riding career started from the ground up - literally.